Home Knowledgebase FAQs Can I still use Google Analytics if I install Bunting? Yes, of course! 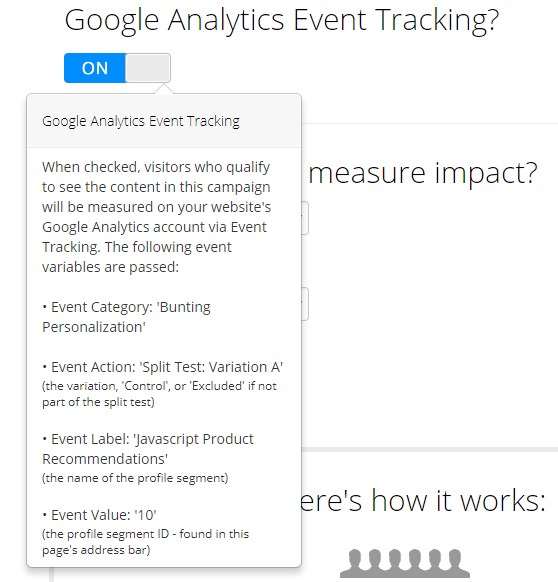 In fact, the first stage of the Measure Impact step is an option to turn on Google Analytics Event Tracking. Many of our clients still have Google Analytics and use it alongside Bunting. This allows them to make a more informed decision on just how much ROI Bunting is providing. Image illustrating enabling Google Analytics within Bunting and its functionality. In the image above it shows what is passed to Google Analytics from Bunting and the name values so you can easily locate them.